Stewed Orka & Cheesy Quinoa. 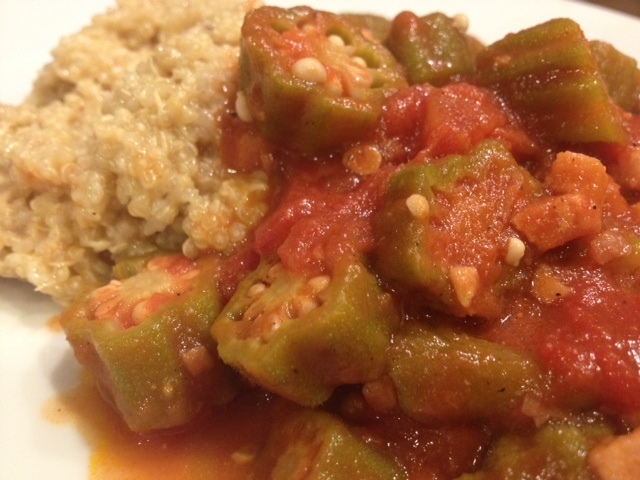 Stewed Okra With Tomatoes & Pancetta Served With Cheesy Pecorino Romano Quinoa. Our first week in Charlotte, we took a trip to the Charlotte Regional Farmer’s Market. I saw some fresh okra, and as a new resident of the South I felt like I had to get it. Honestly, I had no idea what to do with it, so I just sort of threw this together and kept my fingers crossed. Somehow, it turned out really delicious! 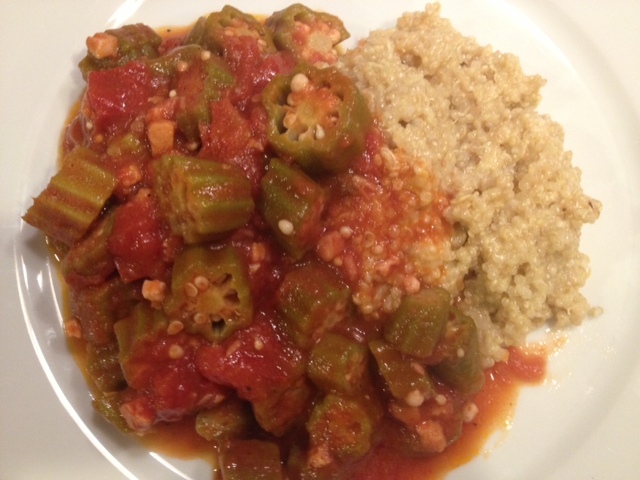 Okra is definitely a new favorite in our household. In a large pan on the stove, heat the olive oil and add in the pancetta. 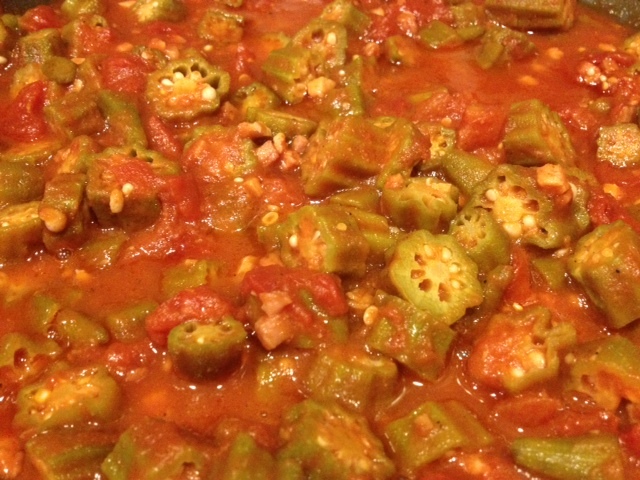 Stir it around for about 3 minutes, then adding in the okra. Cook for about 5-7 more minutes on medium-high heat. Turn down the heat to low and pour in the apple cider vinegar to deglaze the pan. Then add in the tomato sauce and diced tomatoes. Season with a dash of garlic salt and a dash of hot red pepper flakes. Reduce the heat to low and simmer for about 2 hours. In a medium pot, bring two cups of water to a boil. 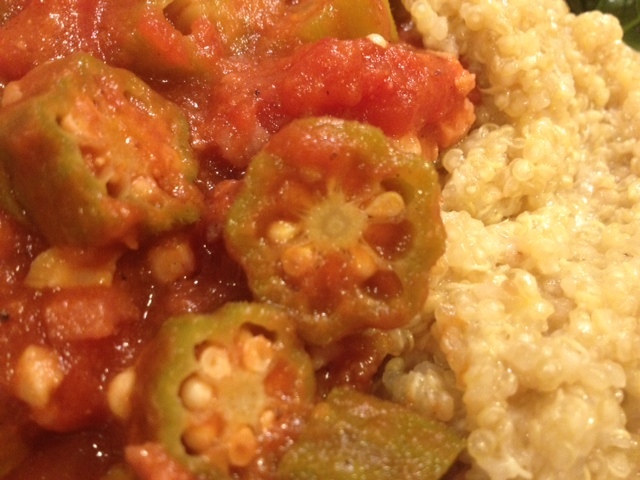 Once boiling, add in the quinoa and reduce the heat to low. Put the lid on and cook until the quinoa has absorbed all the water. Stir every now and then just to ensure the quinoa isn’t sticking to the bottom of the pan. After the quinoa is cooked, stir in the butter, the Pecorino Romano cheese and season with a generous dash of salt and black pepper. Stir well to combine all the ingredients and melt the cheese. 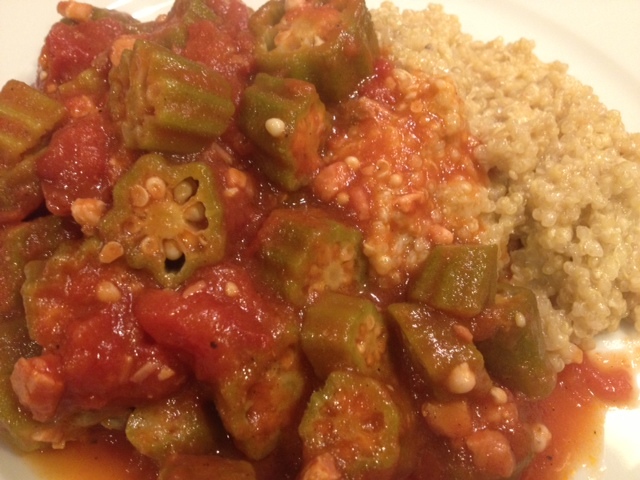 I’ve been looking for more recipes with okra, and this looks delicious!